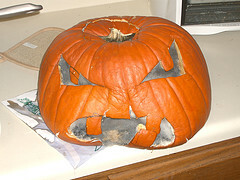 In the spirit of Halloween, I carved a pumpkin for the very first time.It was a very educational experience. I decided to carve the globe. I carved out the full American continent, Africa, Europe and parts of Asia, but if I did Russia I’d be left with no pumpkin.Unfortunately, after a day, the pumpkin collapsed right on Panama (note to self: next time leave the Panama Canal in for support).Debbie carved a very scary angry face. It was much scarier after the thing sat in the kitchen and I got back from spending the weekend in Monterrey. It grew some strange foamy white and black fungus inside (note to self: next time don’t eat it).